The iconic home button has been a mainstay of Apple design ever since the first iPhone debuted in 2007. Even the buttons on the elevators at Apple Park are said to resemble it. The button's tactile circularity promises an escape route to familiarity should users get lost or apps go wrong. However, its delicate components converge upon a recess in the phone's bezel, an area that could otherwise provide extra space to fit a larger display within the same handset profile. 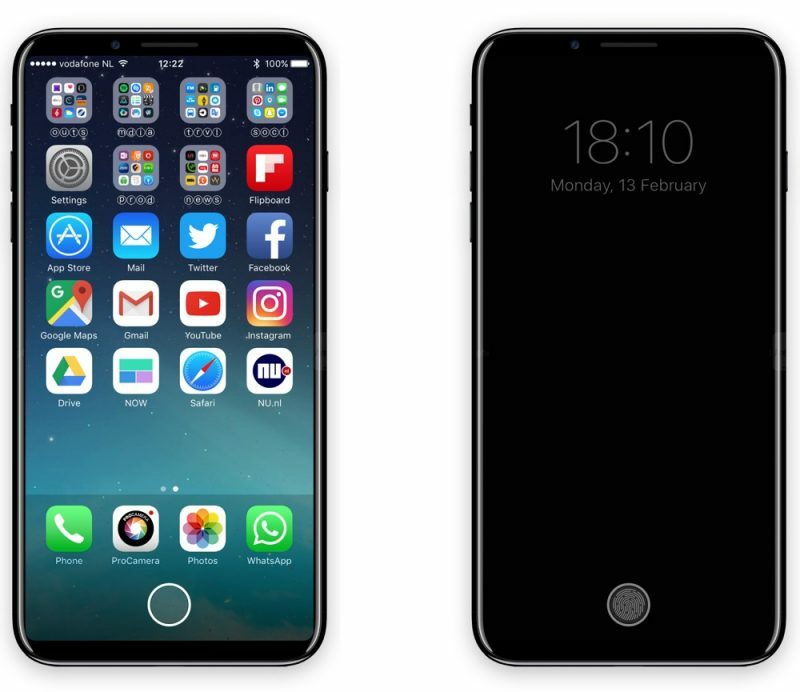 Rumors that the "iPhone 8" will replace the home button as we know it with an entirely virtual one can be traced back to April 2016. 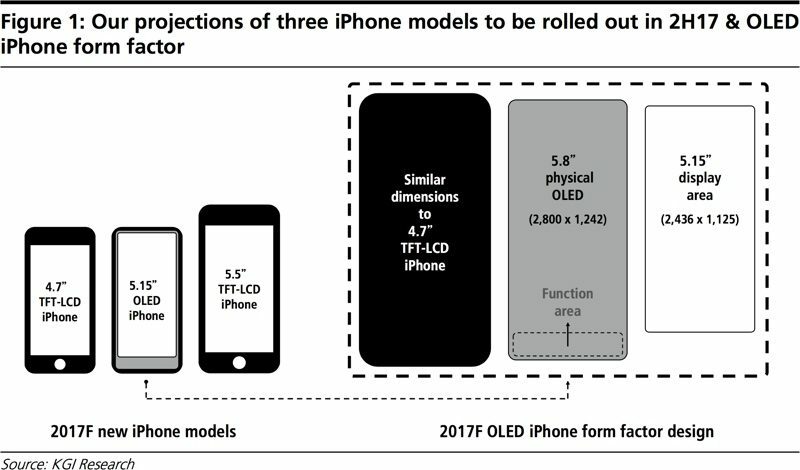 More recently, KGI Securities analyst Ming-Chi Kuo claimed that Apple will introduce a functionally distinct area below the screen exclusively for displaying virtual buttons, with a rumor over the weekend seeming to suggest that such a "function bar" is the reason behind conflicting reports over the display size of an upcoming OLED iPhone. 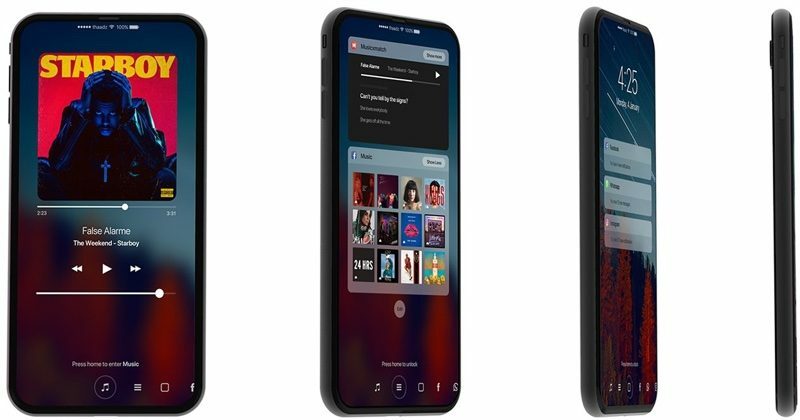 Before the "function bar" rumor first surfaced, MacRumors forum member deuxani shared concept images, reproduced below, that offer some context for imagining how the bar might work. Framed within a 4.7-inch handset with minimal bezels, the virtual home button sits below the dock on the home screen in a separate dynamic space. Assuming Kuo's claims that the 5.8-inch OLED display includes a function bar, the remaining 5.15-inch primary display area allows existing apps to run fullscreen in their existing 16:9 aspect ratio. In the above example, only the home button is shown in the function area, but Apple could theoretically move the dock down with it, or add options for additional virtual icons like Bluetooth, App Switcher, Camera, or Siri. 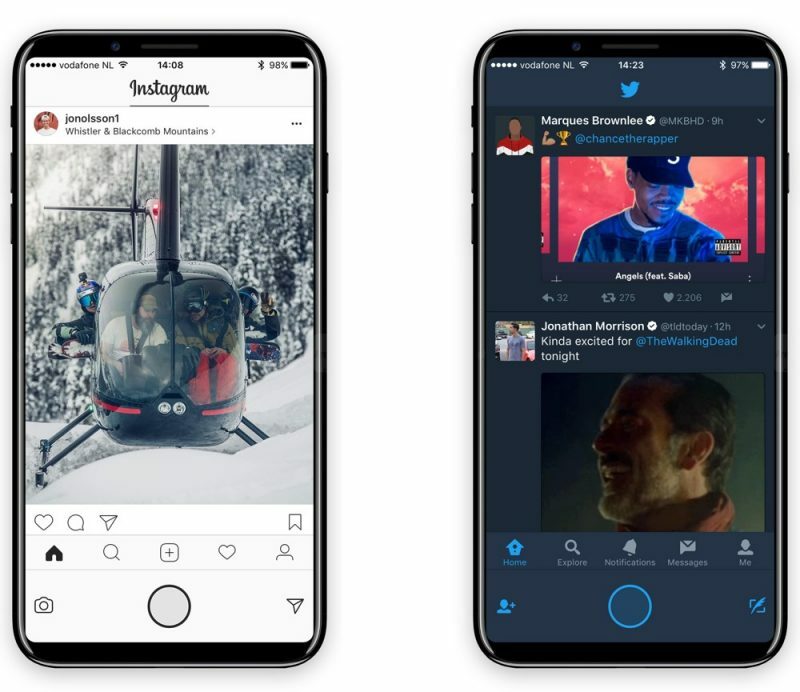 The shot on the right shows how the adoption of OLED screen technology might also enable the home button and indeed other screen elements to remain visible when the rest of the display is turned off. As with the Touch Bar on the 2016 MacBook Pro, native apps could be augmented with contextually adaptive virtual buttons, while third-party developers could code for additional UI elements alongside the home button, or bring frequently accessed functions into closer proximity with the user's thumb, as these concept designs for Instagram and Twitter envision. Other possibilities for virtual buttons could potentially include: Moving the back button from the top-left of the status bar to the bottom-left of the screen, alongside the home button; a scrollable strip to access additional buttons; media playback and video scrubbing controls; in-app navigation buttons; or perhaps additional space for game controls. "Soft" buttons on a smartphone are nothing new, but a "function area" on an iPhone could offer more flexibility by taking cues from the MacBook Pro's OLED Touch Bar. Patents show Apple has explored extending Touch Bar functionality to other devices, while Jony Ive has said the interface is "just the beginning of a very interesting direction" for the company. However, adapting the technology for an iPhone display likely presents distinct challenges, such as how to integrate the various functions the home button has inherited over the years (Siri, Reachability, exit Lock Screen, and so on), and how to avoid the presence of "dead space" where the Touch ID sensor would usually be located. Indeed, ultimately the fate of a home button and "function bar" on an OLED iPhone may rest on Apple's ability to integrate fingerprint recognition technology into the display itself. A report earlier this week suggests Apple has solved this problem, but questions still remain. Will the display have a recess for Touch ID? Will new fingerprint recognition technology function across a larger screen area? And what other bio-recognition features might Apple include that could help solve the authentication issue? Facial recognition, iris scanning, and ultrasound methods have all been proposed. Rumors conflict over whether Apple will ramp up production earlier than usual for this year's OLED iPhone, but we may see part leaks that shed light on the design fairly soon. Other rumored features for the "10th anniversary edition" device include an edge-to-edge display, a glass body, some form of wireless charging, and extended battery life. The "iPhone 8" is expected to launch this September, alongside two more traditional "S" cycle iPhones with LCD displays. The iPhone already has a function bar. Its called the display. As with many new concepts, it will come down to how Apple implements it. I, for one, am looking forward to seeing what they come up with. I think there is potential here. One of my favorite things about iPhone 7 is the non-mechanical home button. I've let friends use my phone as guinea pigs and not one of them have noticed that it was not a button until I tell them. And no, they aren't idiots. So it's basically a touch bar for the iPhone. Makes sense given how apple likes to use the same concepts across their products. Wish 17" MacBook Pro could be offered in a 15" form factor similarly. I don't understand, a MacBook is rather a display without a touchscreen making it easier than an iPhone 8 with integrated fingerprint scanner as well to have zero bezels. One of the main reasons I moved away from Android to iPhone many years ago was that I was fed up with always accidentally hitting the soft buttons on the bezel, and always having to look down at the bezel to press home. Jumping onto the iPhone with its one physical home button was like... coming home. Simple design at its absolute best. Apple, please don't sacrifice something classic and great for something new and kinda cool. You could've just said it will be like Android's on screen navigation setup... Seems fitting that Apple would copy one of the most iconic differences between iOS and Android for their 10th anniversary phone. I look forward to my iPhone friends demonstrating their "brand new" back button! I'd even settle for a bezel-less 16" screen on that 15" MBP.